It may be possible for our technicians to repair your Conel Electric Chain Winder! If you have been unable to replace your Conel Chain Winder (either the Stand-Alone or the Keypad models) and you are considering replacing 1 or 2 out of a bank of 4 or so (or more) winders, call us and ask about repair. It might be cheaper to repair than to replace! Repairing electric chain winders is seldom considered. We live in an age where the habit is to discard. It is possible to repair many Conel winders though. You do not have to throw away the old and purchase a completely new system. Ship it to us for inspection. Click here to email us your question. If your electric chain winder is repairable, we’ll repair it (approximate repair costs may range from $120 – $190 + freight + GST if the repair is possible). If your electric chain winder is not repairable, we’ll let you know and offer to return it to you (you pay the postage) or we can dispose of it. The turn-around-time for this service is not fast. It could take up to 4 weeks. We will send the units back to you via Australia Post or by Courier if there are multiple units. We are not charging to inspect & test your electric chain winder. We will repair it if possible. If we can repair it, then we invoice you and once paid, we send your repaired Conel Electric Chain Winder to you. Alternatively, you are welcome to browse our online shop (click here) or call our sales team today on 1300 694 283 to talk about other stand-alone electric chain winders (click here) or complete awning window opener systems (e.g. Lockwood’s Elevation system). 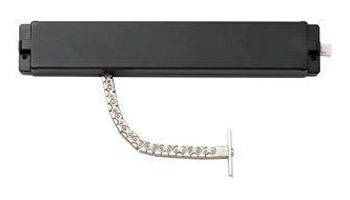 This entry was posted in Door Closers and tagged 36A-DH2500-BKF, Conel, ECW, Electric Chain Winder, Electric Window Opener, Window Operator, Window Winder by admin. Bookmark the permalink.